Day 01: Arrival Paro. Transfer to Hotel. Overnight hotel. Day 02: Morning drive to Drugyel Dzong, 18km away from your hotel. 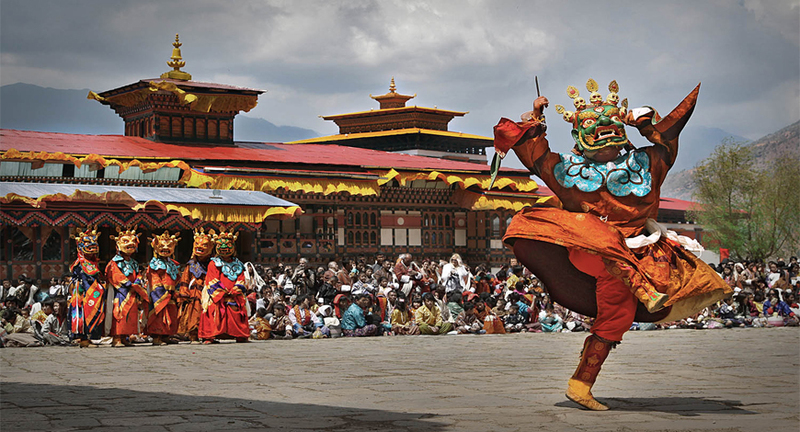 On the way back, you will visit a typical Bhutanese farmhouse and sightseeing trip to Paro. After lunch, drive to Ta Dzong which houses the National Museum followed by a short walk to Paro Rimpung Dzong. Overnight hotel. Day 03: A short drive to Satsam Chorten. From there 2 hour trek to Taksang Tea House for light refreshments. This will be followed by another 1-hour walk to Takshang Monastery. Lunch at the Teahouse followed by a short walk to Satsam Chorten from there 2 hours trek to Taksantg Teahouse for light refreshments. This will be followed by 1 hour walk to Taksang Monastery. Lunch at the Teahouse followed by a short walk to Satsam Chorten and 2 hours drive to Thimpu. Overnight at hotel Thimpu. Day 04: Sightseeing of Memorial Chorten, National Library, Handicrafts, emporium and Tashichho Dzong. Overnight hotel. Day 05: In the morning drive 3 hours to Punakaha, across the Dochula Pawss. On the way light refreshments will be served at Dochula Café. Lunch at Khuru camp. After lunch visit Punakaha Dzong. Overnight at Khuru Camp. Day 06: Visit a typical farmhouse in the morning. You will be served a traditional buttered tea with "zaw" (Puffed rice). Visit Wangdi Fordrang Dzong and return to Khuru Camp. Day 07: Drive to Paro and fly from the country.